Pulsair’s non-shear, efficient vertical slurry mixing tank, is the best mixing system for keeping powder activated carbon slurries suspended and uniformly blending in the tank. The Pulsair mixing process is fast and more efficient than mechanical mixers. 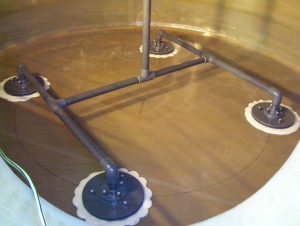 The mixing process works by sequentially releasing timed burst of compressed air on the tank bottom underneath flat round open disks called accumulator plates. A pressure zone is created around the plate to stir up and agitate settled powder activated carbon particles. These particle are lifted and pushed to the surface above and below the large bubbles. This non-shear mixing process is energy efficient and requires zero in-tank maintenance. Example of efficient ‘bottom-up’ mixing process in test tank.